I have mentioned previously that Pip and I have challenged each other. We’re a week in and I haven’t explained it at all yet! I figured it would be best to wait until today – August 1st – and pop it all in one post with the August challenge I’m taking on. This month I am also taking on a 30 day challenge. I have done the squat challenge before, but I wanted to push myself into doing more with my upper body. 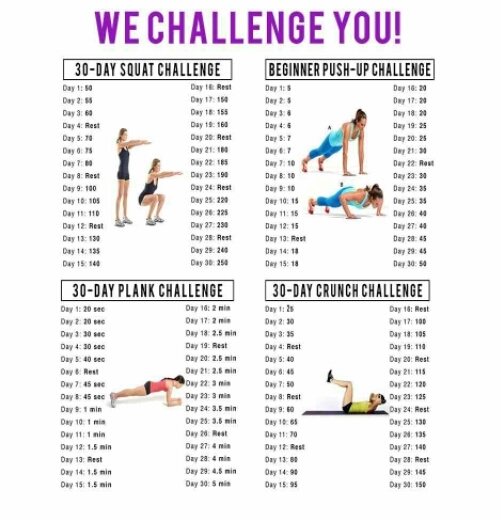 This challenge combines four 30 day challenges – squats, push ups, plank, and abs. I may die inside doing this, but I plan to stick with it! Do it with me! We can link up! Here’s to a happier, healthier August!